Your business is growing. Your brand is innovating. Your strategy is evolving. But does your office embody what you stand for and motivate your employees to be the best they can be? 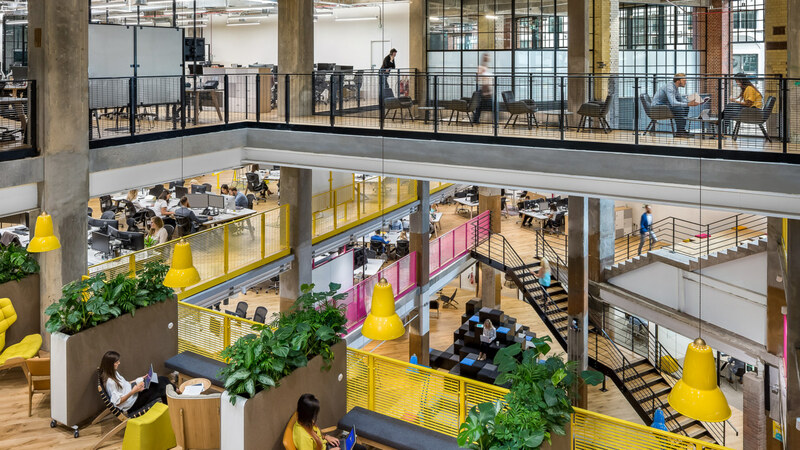 Do not underestimate the power of a work environment that fosters productivity, inspires connections and transforms people’s working lives, not to mention the benefits for business. 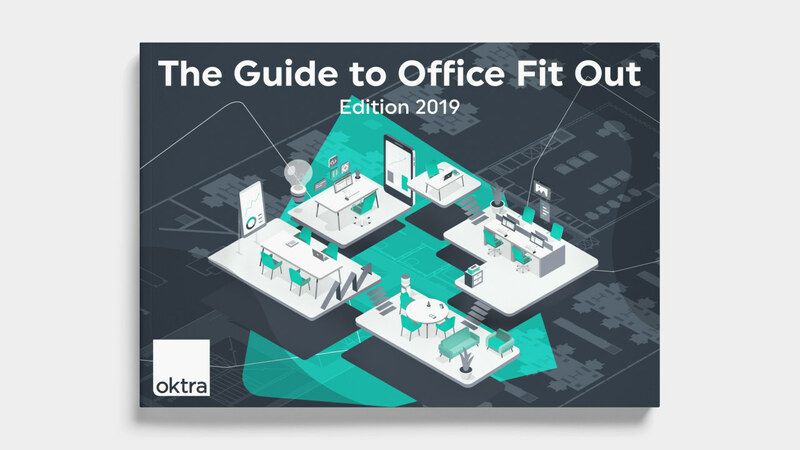 Make sure your organisation is not left behind, as businesses continue to recognise the advantages of updating their offices to suit their multi-generational, dynamic workforce. 1. Create an agile work environment, where employees have the flexibility to work in a variety of spaces to support different needs and interactions. 2. Connection is a basic human need. Include a central hub, such as open tea point or kitchen, where people can connect throughout the day. 3. Provide suitable workstations to boost productivity; ergonomic furniture and up-to-date technology ensure employees can do their jobs properly. 4. Human-centric lighting systems. These can improve employee wellbeing, mood and therefore productivity. The greater the exposure to natural light, the better. 5. Break out spaces help refocus and reenergise employees. Having a break from the screen during the working day will keep employees motivated. 6. Make a good first impression. 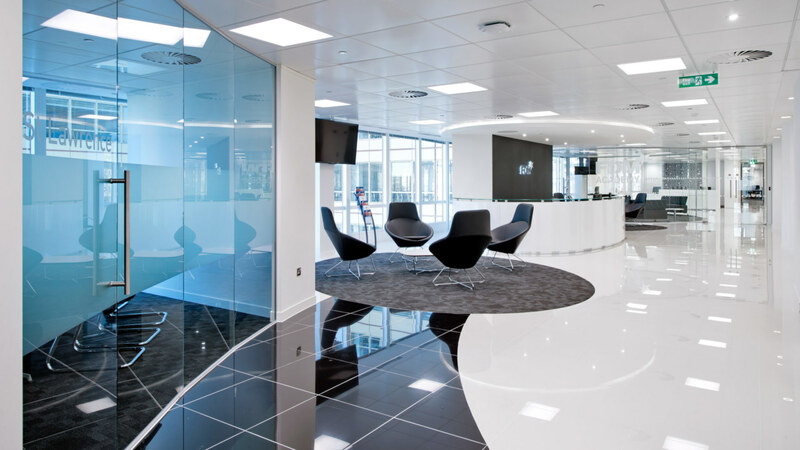 Your reception is the first glimpse of your brand – keep it open and allow people to see a welcoming, buzzing office that represents who you are. 7. Your workplace should embody your brand. Choose a colour palette that reflects your brand and the type of work you do. 8. Consider your layout and make sure there is enough space per employee; there should be a minimum of 11m3 per person. Use our office space calculator if you are unsure. 9. Bring nature inside. People have an instinctive need to connect with nature and it is proven to boost productivity by 15%. 10. Eliminate clutter. You will have a more efficient workforce if your work space is clean and organised, without distractions. 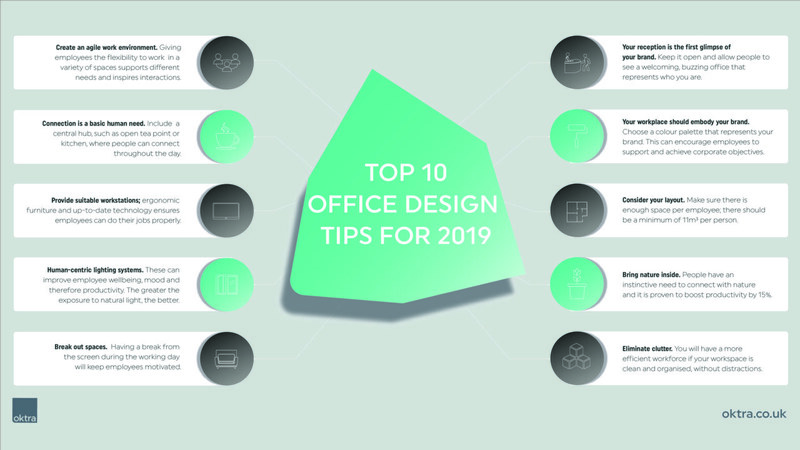 How Much Should You Spend On Your Office Design?